The earliest known feline-human association, was discovered in 2004 during a Neolithic grave excavation in Shillourokambos, Cyprus. The grave contained the skeletons of a human and cat which closely resembled an African wildcat as opposed to the domestic cats of today. 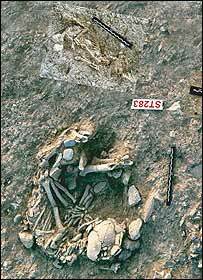 The presence of a cat in a human grave suggests either ownership or the animal possessing some sacred or spiritual properties. This discovery, combined with genetic studies, suggests cats were probably domesticated in the Middle East, in the Fertile Crescent, around the time of the development of agriculture when they were brought to Cyprus and Egypt. There is evidence for the domestication of cats in Quanhucun in China over 5,000 years ago. The cats are believed to have been attracted to the village by rodents, which in turn were attracted by grain cultivated and stored by humans. In ancient Egypt, cats were sacred animals, with the goddess Bastet often depicted in cat form, sometimes taking on the war-like aspect of a lioness. 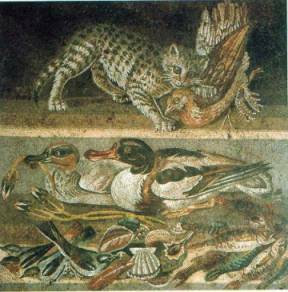 Images of cats littered the paintings and Egyptians took great care to mummify their most prized feline friends. 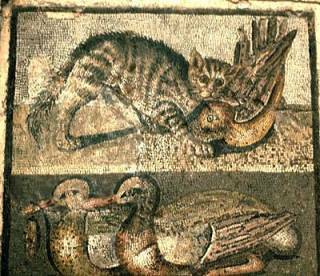 The Romans are often credited with introducing the domestic cat from Egypt to Europe. In Roman Aquitaine there is a first- or second-century epitaph of a young girl holding a cat and it is believed to be one of the earliest depictions of Roman domesticated cast. However, cats possibly were already kept in Europe prior to the Roman Empire, as they may have been present in Britain in the late Iron Age. Domestic cats were spread throughout much of the rest of the world during the Age of Discovery, as they were carried on sailing ships to control shipboard rodents and as good-luck charms.